The Golden Nugget Casino in London is located at Piccadilly Circus, right in the centre of London's bustling everyday life. The choice of name might strike some people as odd, yours truly included, but we shall overlook this small blunder and move on to a proper review. This establishment has been around the London gambling scene for an impressive five decades. 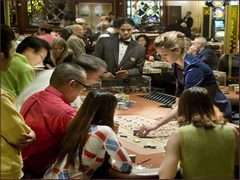 In that time it has become one of the hallmarks of the London casino scene, attracting gamblers from all generations. But the age has taken its toll on the interior as it feels more like a 1970's Las Vegas casino than the modern venue that you might expect from such a central location. This means that it just does not stay up to par with some of the new and ultramodern casinos that we find all over the UK these days. With that said, there is a bit of charm in this old-school look that the Golden Nugget offers. The fake gold plated handles and railings make you feel like you are walking in to a different world and a different time. The casino opens at 11am and finishes at 5am. The only exceptions are weekend and bank-holidays where this venue turns in to a 24-hour gambling machine. Golden Nugget is part of the prestigious London Clubs International and members can enrol in the Player's Rewards programme which rewards members on all games: slot machines, electronic games and at the tables every time they play. The points can be redeemed at 10 Player Rewards casinos across the UK. "If it ain't broke, don't fix it" - we have all heard this saying and with 50 years under its belt we understand why the Golden Nugget is so popular. It has managed to find a winning concept and stuck with it for a lot longer than almost any other casino in the area. Black, gold and metal makes up most of the atmosphere in the casino. All of the tables are laid out in straight lines with very little space on the sides. Again you can get a bit of a throwback feeling to the old Vegas days and it is adds character to the venue. There are several different classic casino games such as Blackjack, American Roulette, Three Card Poker and Punto Banco. You will find roughly a handful of tables for each game type. The tables are accompanied by 20 slot machines and a few Pai Gow tables. This makes for a very good selection of casino games and more than enough to keep you busy throughout the evening. The Golden Nugget Casino offers an excellent bar that that offers a good range of drinks. One of the main features in the bar is the huge amount of massive plasma screens dotted around where you can watch the latest sporting events live. With a selection of beer, wine, champagne, spirits or cocktails the Golden Nugget Bar does not disappoint the thirsty gambler. One of the highlights at the Golden Nugget is its restaurant - named Bistro. Here the hungry gambler can find Thai food, burgers and even a full English breakfast. However, the Bistro restaurant does not really match up with some of the other casinos in the area and calling it average would most likely be the fairest grade. Most of the plasma screens in the whole venue can be seen and heard in the restaurant, making it a bit too noisy if you are after nothing but a quiet meal. When it comes to promotions, events and tournaments there are few casinos that can match the Golden Nugget. Their website is constantly updated with the latest events and promotions and you will instantly see the amount of time and effort put in by the managers to make this an attractive place to gamble. One of the best promotions - ongoing for the last few months - is their Lucky Scratch Card. Every visitor between certain hours of the day will be given a scratch card that guarantees a win. Some rewards might be small, such as a free drink or free slot spin - while others are a lot more attractive. These small promotions are always nice to see at larger casinos and it makes every customer feel special. One thing worth noting is that you need to pick up your scratch card at the reception - they are not handed out when you enter. Every there is a Punto Banco event where the 14-seat tables will host some exciting games of Punto Banco and Punto 2000. One of the most exciting things about these games is that you are allowed to pull from the shoe yourself - which seems to be one of the big selling points according to the casino's promo. Why The Golden Nugget Casino London? The Golden Nugget Casino in London does not match up to the casino that it shares a name with in Las Vegas. But if you wanted a Las Vegas experience you would travel there. This casino is a great venue for some good old-fashioned gambling. The throwback look with gold plating just makes you like the place even if you might think it is tacky. The selection of games is extensive enough to keep you busy for hours on end and with such a huge range of promotions and events you will never get bored. Sports, drinks and food can all be combined in the restaurant and bar area when you feel like you need a break from the tables or slots. All in all there are few casinos in the UK that can offer the same retro feel as the Golden Nugget in London.